surface in this house has gotten the Easter treatment. Once I got started, there was no stopping me! of my vintage blue dresser all ready for Easter. Can you see the snow through my lace curtains? I'm hoping it doesn't stick around too much longer. I hope you have a Spring-filled day! Yes it seems that warmer weather is here as well.....Yeah! I'm with you...it seems to be slow going here for Spring decorating...one little spot at a time! Such a sweet little vignette, Gina! Perfect and lovely. Full of whimsy too. It makes you want curl up in the sofa and just get lost in the magic you provided with each piece. Love the - is it papier maché? - rabiit and that amazing "cloche". You have a beautiful house and created an amazing Home. That is just so pretty and springlike! I really love that blue painted dresser- it is the perfect base for your vignette. Well done - it really looks awesome. I just love your blue vintage dresser Gina. It looks beautful all decorated for Spring...I do hope Spring makes an appearance soon over at your neck of the woods. We are having a beautiful sunny day here, but it did get a little scary earlier today...we had a little earthquake. I know, living in California all my life I should be use to them by now, huh?...Hee, Hee, Hee. Sending you warm hugs. We have the same cloche...except I painted my ORB....it is one of my favorites! Looks nice and springlike! Hopefully that snow in the background will melt very soon! YEAH! Awww...this looks so cute. I love the wire cloche. I can't wait to unpack my spring things! Very pretty! You have a ton of Easter decorating done. Hopefully, you won't have any additional snow. Hang in there, Gina, spring must be around the corner. At least you didn't let the lingering snow prevent you from getting in the mood for spring. 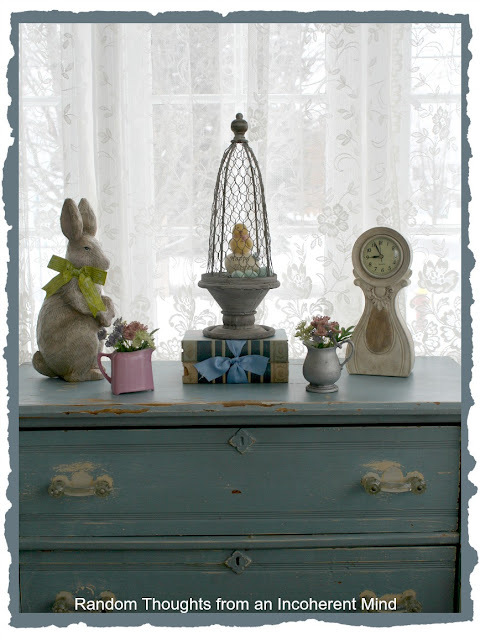 Your blue dresser is even more gorgeous with the bunny, cloche and other cute things on the top. Thanks for your visits to my blog. Well it sure looks like Spring ont he inside of your house. It looks really cute. It is supposed to snow here tonight. Not much but still. Spring will come sometime. I love spring decorating after the winter. Yours looks so pretty and cheerful! Working on this at our house. Yours looks fresh and springy. Awww..you sure are Eastified Gina! Gina, this is a beautiful vignette! And it looks so pretty on your gorgeous blue chest. Very pretty! Cute as always! Love all your touches and it all looks great on your blue dresser! I love your vintage blue dresser, and the Spring vignette you've placed on top is beautiful ... sure to chase the snow away! Your books tied with a ribbon are adorable. The cloche is equally as perfect! No spring here in Ohio. It's in the 20's again and we're expecting snow in a few days. Ugh. I am truly over it! Tell your Peter Cottontail, to talk to my Peter Cottontail. And make it quick like a bunny because Easter is just around the corner and you'd never be able to tell it at my house. The dresser looks gorgeous! The wear on that blue is just perfection! The little clock left me swooning, sooo cute! Very nice! 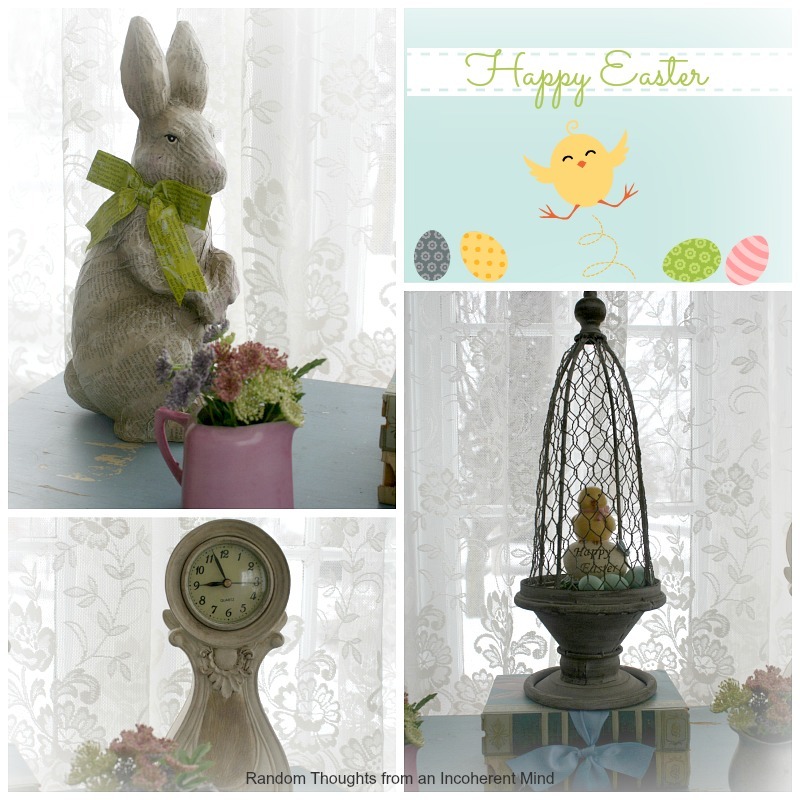 Love the finish on the dresser and your Easter decorations! What a great look! I have the snow white affect going on outside (still) here too. Can't wait to see green! That is such a sweet vignette, Gina! 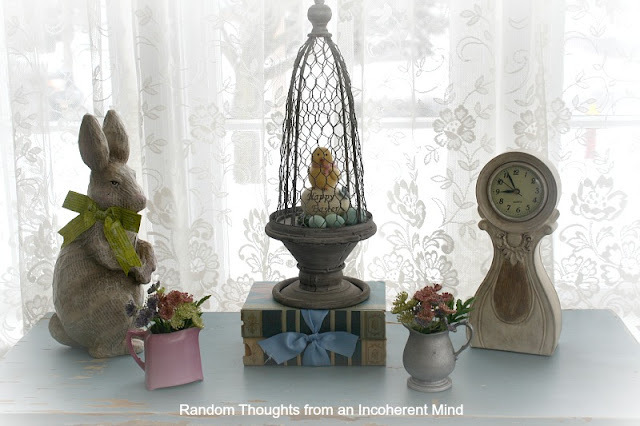 I have that same wire cloche and have so much fun decorating with it! I'm sending you lots of "Spring-thoughts," because we are definitely into it here! Absolutely beautiful! I just love Easter and everything there looks perfect. Love those lace curtains. We just got about an inch of snow but it won't last long! Hope yours has gone by now. Love your tablescape Gina! All the green says "spring"
Hi Gina, glad to see you have your Spring decor all out. I am so ready for Spring. We had a couple warmish days but today is cold and we are supposed to get a little snow tomorrow.